Michael is now a tropical storm near the Georgia/South Carolina border. Strong winds, heavy rain, and tornadoes are expected across portions of Georgia, South Carolina, and North Carolina today. Officials in Seminole County say what is now Tropical Storm Michael is responsible for the death of an 11-year-old girl. Officials in Seminole, Georgia say Tropical Storm Michael is responsible for the death of an 11-year-old girl. GPB's Taylor Gantt reports. The Seminole County Emergency Management Agency said a tree fell onto a home Wednesday evening, killing the girl. Emergency crews were only able to reach the damaged building after nightfall because of downed power lines, poles and trees. This is second death attributed to Michael; the first came Wednesday in Gadsen County, Florida, when a man was hit by a falling tree. After hitting the Gulf Coast as a Category 4 hurricane with wind speeds of 155 mph, Michael is now a tropical storm making its way through Georgia and heading into the Carolinas. 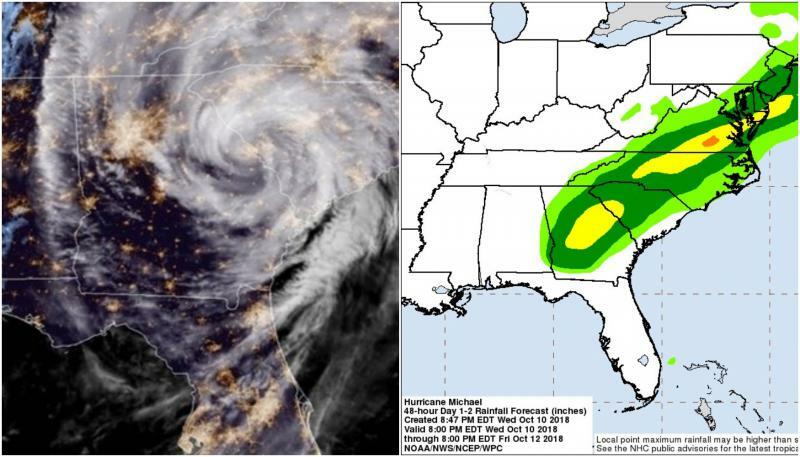 Michael is projected to leave Georgia and move into South Carolina by this afternoon.